We hiked on the Appalachian Trail. We did not have to hike far to see amazing 360 views! Not very crowded. This was one of my favorite places to camp. The profile trail is a great hike but it is 3.6 miles of mostly uphill on rugged terrain. Permits are required on this trail. They are free and available at the trailhead. We also visited the swinging bridge which was a very short and windy hike with great views. Lots of Great Hiking Trails! This campground is beautiful for fall camping. There are over 10 miles of trails to hike. We also conoed down the creek. The creek is about 2.5 miles long and took us only 2 hours to paddle. The campground was also very clean! Easy 1 mile hike from the parking lot with beautiful views! This is the best primitive camping I have found near Raleigh, NC. Permits are required and available at the park office for $13. Make sure you bring a water filter and TP. The tent campsites are right next to the water with beautiful views of the lake. You can kayak directly to your campsite. There’s also a swimming beach with pfds, grills, and picnic tables available. Each campsite has a trash can, picnic table, and fire pit. The only issue we had was the drinking water. The water pump next to our campsite produced brown water. We had to bring large jugs of bottled water to use instead. This campground is very close to all the fun activities Williamsburg has to offer. The campground was very clean and the staff was super friendly. The train was very close to our campsite which was only a problem at night. The train ran all throughout the night making it very difficult to sleep. We purchased some ear plugs which were extremely effective in helping us sleep during the constent train activity. Stayed here after visiting the Divine Llama Vineyard. Very convienient location. Unfortunatley I had an injured foot so I couldnt hike much but it was easy to drive up to see the overlook views of pilot mountain. I can’t wait to go back when I’m able to hike! Gorgeous 360 views, rock climbing, hiking, and ponies! This place is gorgeous especially during the fall season. There is so much to do! I wish I could’ve stayed longer. I spent 3 nights backpacking through the park and I can’t wait to go back! The bath house at this campground is very nice and clean. They even have an outdoor sink on one side where you can clean your dishes. Our campsite was one of the furthest from the entrance though so it was a bit of a hike to the bath house. This campground is very quiet and only 15 minutes away from Boone, NC. There are lots of hiking trails to explore and they also have a campground store that sells firewood and charcoal. They do not allow bringing firewood into the campground, you must purchase it at the store. This campground offers so much to do on the scenic Blue Ridge Parkway. There is a 5 mile long trail that goes through the campground called Boone Fork Trail. This trail leads to Hebron falls where you can explore giant boulders and have a picnic. There is also an area just 1.5 miles from the Boone Fork Trail parking lot where you can go swimming and sliding off rocks. There are also many picnic tables along the river with small charcoal grills. Price Lake is also located next to the campground and offers kayak and canoe rentals by the hour. There are many other hiking trails near by along the parkway. This campground is only 30 minutes away from Boone, NC which offers an abundance of great restaurants and shops. It can get pretty busy during the summer so you will want to check in as early as possible if you don't have a reservation. Great campground for car camping with great views! 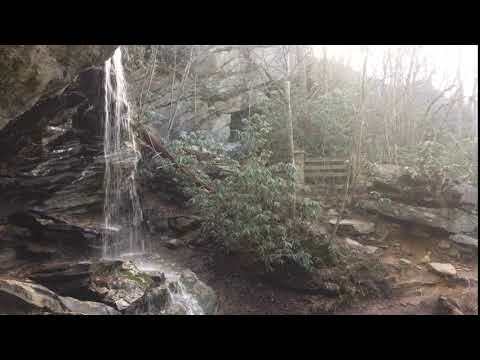 There are over 20 miles of trails to hike that lead to waterfalls and beautiful mountain views. Swimming is also an option during the summer months. The bathhouse is closed during the winter months to avoid frozen pipes. There is a privey available just across the road from the bathhouse but you need to bring your own toilet paper.